SAW046338 SCOTLAND (1952). 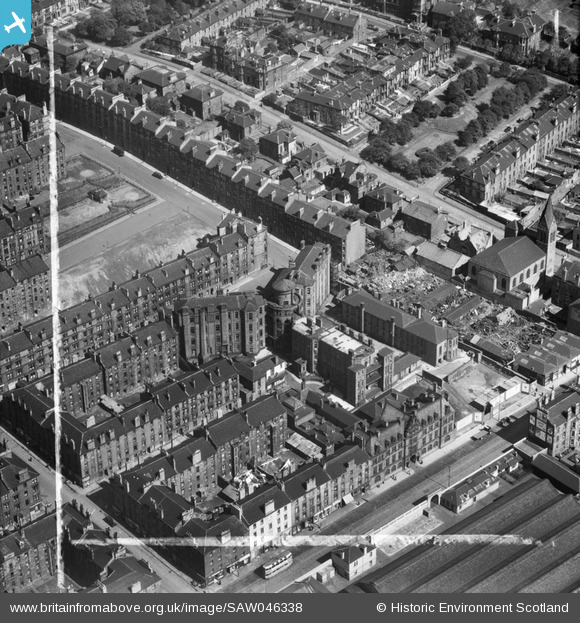 Glasgow, general view, showing Eastern District Hospital, Duke Street and Westercraigs. An oblique aerial photograph taken facing east. This image has been produced from a crop marked negative. Title [SAW046338] Glasgow, general view, showing Eastern District Hospital, Duke Street and Westercraigs. An oblique aerial photograph taken facing east. This image has been produced from a crop marked negative. The original Gallowgate meat market, established in 1879. The sheds that can be seen from Duke Street housed the cattle and meat markets. Eastern District Hospital known as Duke Street Hospital opened 1904 is listed Category B.